Max has the distinction of playing in the very first game in Weeghman Park history as a member of the Chi-Feds, and then playing in the very first game the Cubs played in the same ballpark (as a Cub). He was their star right fielder during that time. During their pennant winning season of 1918, he led the league’s outfielders in fielding percentage, put-outs, double plays, and assists. He also, unfortunately, dropped an easy fly ball in the 1918 World Series. The Cubs were leading the game 1-0 at the time, and the dropped flyball allowed the Red Sox to score two runs and win the game 2-1. Whenever someone accuses the Cubs of throwing that series (entire books have been written on the subject), this is one of those plays that is discussed. 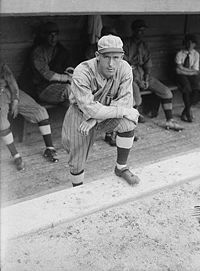 In 1922, Max was traded to the Cardinals for Cliff Heathcote in the middle of a double header. The two men just changed uniforms and dugouts. Harry got into only 24 games with Chicago in their second National League season, before moving on mid-season to play with Cincinnati. He played second base, center field, and catcher in the era before players wore gloves. Among his teammates in Chicago were Hall of Famers Al Spalding and Cap Anson. He died before the turn of the century (in 1898) at the way too young age of 42. He was a member of the last pennant winning Cubs team (1945) as the backup catcher, and even played in two of the 1945 World Series games. He struck out as a pinch hitter in Game 5 at Wrigley Field, and came in to catch in extra innings during Game 6, the last World Series game the Cubs won. (For more about Dewey, check out “This Week in 1945″). He was a Marine, and a boxer before he came to baseball, so it’s no wonder his teammates called him Tiger. Before he made it to the big leagues, Hoak played in Cuba for a part of a season and faced future dictator Fidel Castro in a game. He was a World Series champ with the Dodgers in 1955, and shared third base with an aging Jackie Robinson that season, so the Cubs were excited to get him (along with Russ Meyer and Walt Moryn) a few weeks after the series ended. Unfortunately, he had a terrible season in Chicago in 1956. In over 400 at bats, he hit only .215, so the Cubs got rid of him. Of course, after he left the Cubs, he immediately became an All-Star (in 1957). Then, in 1960, he finished 2nd in the MVP voting and led the Pittsburgh Pirates to the World Series championship. Hoak died of a heart attack while chasing his brother-in-law’s stolen car. He was only 42 years old. Thomas was a backup outfielder/first baseman for the Cubs toward the end of his playing career. One of his claims to fame came in 1966 when he knocked in the winning run in the bottom of the 11th inning to beat the Astros. While the Cubs were playing at Wrigley Field that afternoon, John Lennon was holding a press conference at the Astor Hotel in downtown Chicago, apologizing for his famous “we’re more popular than Jesus” remark. Thomas retired after the following season and went into management. He was one of the architects of the Whitey Herzog-era Cardinals in the 80s, and then became the GM of the Phillies and led them to the 1993 World Series. The ex-Cub GM watched his ex-Cub closer Mitch Williams give up the walk-off series-ending home run to the ex-Cub outfielder Joe Carter. The Venezuelan was one of the relievers in a very shaky Cubs bullpen in 1970. He saved two games for the Cubs, but he was routinely rocked. His final ERA for the season was 5.82. The Cubs tried to convert him into a starter in the minors the next season, and he stayed in their system for the next four years. He never made it back to the big leagues.